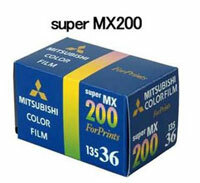 Mitsubishi Imaging (MPM) Inc. announces the introduction of Mitsubishi MX-II color film. Mitsubishi MX-II color film incorporates the latest emulsion technologies, rendering vivid color, extremely fine grain, and a wide latitude, ensuring consistent results across all exposure conditions. Latent image and raw stock keeping properties have been enhanced as well, making this product extremely stable both before and after exposure. MX-II 200 200/36 135-36 exp.